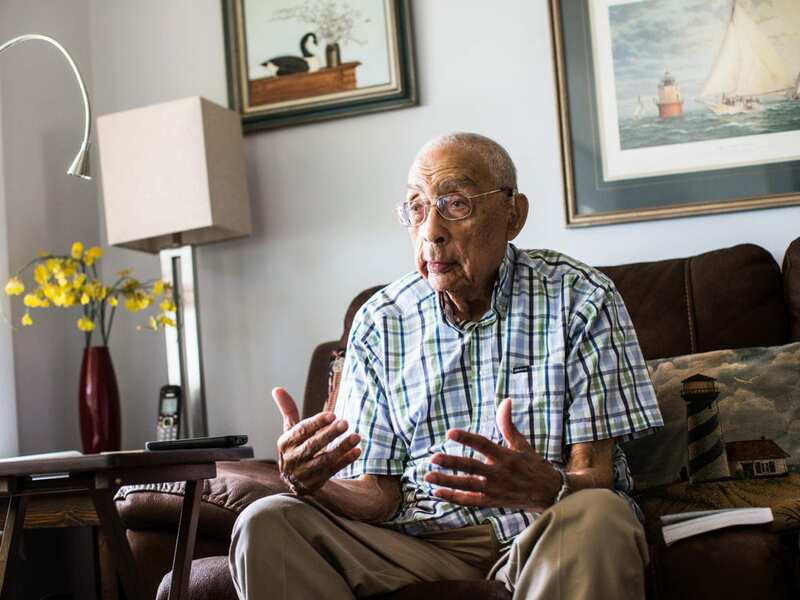 WASHINGTON, DC — Simeon Booker, for 50 years was Washington bureau chief for Jet and Ebony magazines and at 99 the dean of black journalists, died Sunday at an assisted-living community in Solomons, Md. He had recently been hospitalized for pneumonia, said his wife, Carol McCabe Booker, Emily Langer reported for the Washington Post. “Few reporters risked more to chronicle the civil rights movement than Booker,” Langer wrote. “He was the first full-time black reporter for The Washington Post, serving on the newspaper’s staff for two years before joining the Johnson Publishing Co. to write for Jet, a weekly, and Ebony, a monthly modeled on Life magazine, in 1954. Booker was in Chicago, hometown of 14-year-old Emmett Till, when he heard that the young man had disappeared while visiting relatives in Money, Miss. Jet magazine displays some of Simeon Booker’s most memorable work in reporting online in 2015, in connection with his George K. Polk journalists career award. For many African Americans, news did not happen if it did not appear in Jet, but Booker’s reporting and the shocking photographs took the Till story beyond Jet’s readership base. “Like Till, Booker grew up in the North and said he had never entered the Deep South before traveling to Mississippi to cover the trial of Till’s accused killers, Roy Bryant and J.W. In 1952 Simeon Booker, the ‘pioneer’ black reporter, was unprepared for his reception in the Washington Post newsroom. “An all-white jury acquitted the defendants after deliberations lasting roughly an hour. Later, Bryant and Milam confessed to the killing in a paid interview with Look magazine. “Mr. Booker was in constant peril as a black journalist reporting in the South. But the Till case presented particular dangers. A mock Jet cover for Simeon Booker’s retirement in 2007. Booker and his colleagues found two rooms in the Standard Oil building on Constitution Avenue. “As one of the few black reporters in Washington, he wrote a column for Jet called Ticker Tape U.S.A. and led editorial coverage of the executive and legislative branches at a time when black reporters were largely excluded from news events as from everyday life. He covered 10 presidents and traveled to Southeast Asia to report on the Vietnam War. Booker was inducted into the Hall of Fame of the National Association of Black Journalists in 2013 , was the first African American to win the National Press Club’s Fourth Estate Award in 1982, and received the George Polk journalism career award in 2015. Admirers also campaigned for Booker to be awarded a Presidential Medal of Freedom and the Congressional Gold Medal. “For the better half of a century, I was known more often as just ‘the man from Jet than by my given name, as I reported on black America’s march to freedom from two of the most divergent viewpoints: the protesters on the ground, converging upon the courthouses, state houses, and legislatures to peacefully demand their constitutional rights, struggling to win the battle before others might take up the fight in suicidal desperation; and the men in the White House; the succession of U.S. presidents confronted with an unstoppable movement, and for one reason or another irrationally wishing it would go away. “I was one of a small but dedicated cadre of black reporters and photographers whose stories and photographs in the black press finally drew the attention of mainstream media — and the world — to incidents of state-supported terrorism, as cameras caught public officials turning their backs on white mob violence, police siccing vicious dogs on peaceful protesters, powerful fire houses slamming down women and children, and police horses galloping over prone bodies. The stories and pictures brought a hue and cry from around the world, an embarrassed White House was finally shamed into action. “In 1952 Simeon Booker, the ‘pioneer’ black reporter, was unprepared for his reception in the newsroom. Coldness and hostility replaced the support usually volunteered newcomers. Outside the newsroom, Booker encountered questioning of his credentials, cab drivers who would not pick him up, the overtly racist Chief of Police Robert Barrett, who once physically threatened him, and a lack of welcoming eating places.